We’ll show you how to get the Valentino look on a college budget. I tried, guys, I really did; I tried not to write about Valentino (aka my favorite fashion house ever), but once I laid my eyes on their Spring 2015 RTW collection, I knew it was a lost cause. Maria Grazia Chiuri and Pier Paolo Piccioli, Valentino’s creative directors, created a fab collection that I would love to have in my closet. Between flowy dresses and skirts, fitted shorts, and looks balanced with gorgeous coats, the runway was full of fabulous outfits. The detailing in each outfit– incredible embroidery, bold prints, and luxurious fabrics– was on point. And with a varying color palette that includes pastel pink, bold red, crisp white, and rich blue, it’s a collection that is sure to appeal to almost everyone! This first look is all about balance. The top is bold and structural while the skirt is fun and covered in chic embroidery. The navy blue is a great background to the aqua and tan accent colors, and pulls the whole outfit together. 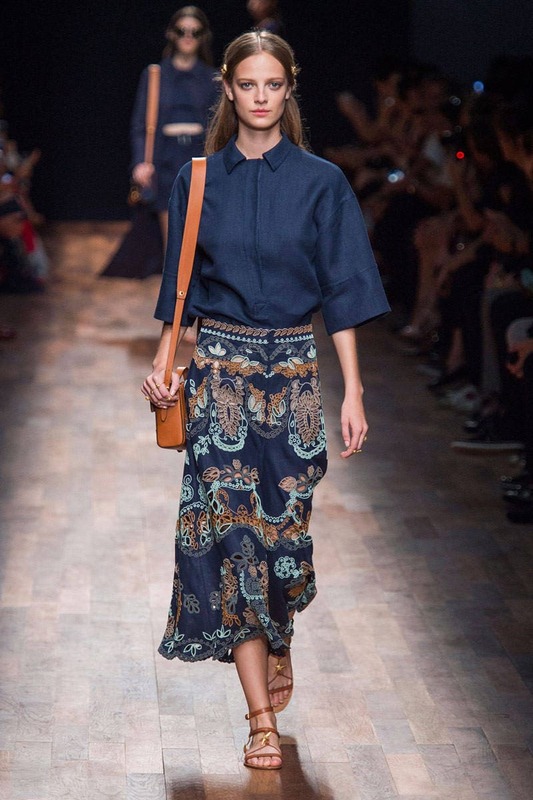 Start with a boxy navy blue top paired with an embroidered maxi skirt. Accessorize with a tan-colored shoulder-bag and similar-hued sandals with gold detailing. Stack gold rings and swipe on a dusty rose blush to get a beauty look like the model’s. If I could pick just one outfit from this collection, it would be this one. The combo of the flirty white romper with an industrial-chic jacket is edgy and fashion-forward. The bold pop of red, the aviator sunglasses, and lace-up gladiator sandals perfectly complement the rest of the look. Channel the designer look by slipping on a fun romper and a trendy utility jacket. Choose a neutral-colored nail polish and gold rings before slipping on dark aviators. Finish the ensemble with lace-up sandals and a bright red bag. I have a million LBDs— from casual to dressy— and this one is definitely envy-worthy. The v-neck and straps make it edgy and ideal for a night out. Because there aren’t very many frills or add-ons, it’s a great of example of a “less is more” kind of look. Recreate the above outfit with a v-neck LBD. Slip on knee-high gladiator sandals and bold, gold rings. Choose starfish earrings to channel the collection’s sea-inspiration, then pull your hair back with a matching gold hair clip. Finally, grab a black purse and swipe on a peachy-pink lip color. What did you think of this collection? 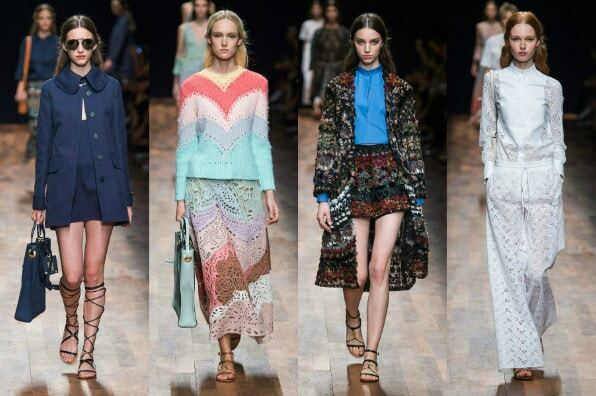 Are you in love with Valentino’s spring ensembles? Which of these looks is your favorite? Would you wear any of them? Remember to let me know your thoughts in the comments below!